At Flooring America of Oregon City, we have a wide variety of vinyl floor options and styles in our large showroom. Today’s vinyl flooring products are created with state-of-the-art technology to create realistic designs that imitate wood, stone, and other high-end products. With one visit to Flooring America, you’ll see how resilient flooring is more stylish than ever. Don’t give up getting the look you want for your home because it appears to be out of your budget! Vinyl floors are an affordable and practical way to bring the design and style you love into any area of your home. Extend the warm and cozy look of wood flooring in your kitchen. Your bathroom becomes a relaxing spa oasis with the appearance of stone flooring. 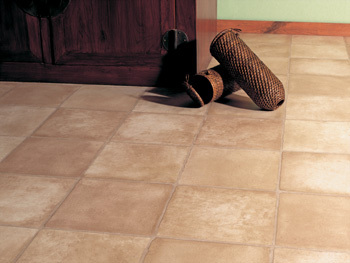 With more options than ever, vinyl floors can transform the high traffic areas of your home with ease. As a widely recognized option for playrooms or game rooms, vinyl floors are softer and more forgiving than other flooring types. Since vinyl flooring is so easy to clean, homeowners with children or pets will love the simple care that vinyl floors offer. Talk to the vinyl flooring experts at Flooring America of Oregon City to discover how vinyl flooring can affordably update your space. Vinyl floors are very easy to install. While some people choose to install their vinyl flooring themselves, many people choose the expert installation of vinyl flooring professional. Talk to our vinyl flooring installation professionals to make sure your vinyl flooring is installed correctly and looks great for years to come. When you choose affordable vinyl flooring for your home, you are choosing durability and easy maintenance without sacrificing aesthetics. Visit Flooring America today to find out more about the many vinyl flooring selections we offer to easily update your home. We're proud to serve customers throughout Clackamas County, Oregon, including the cities of Oregon City, West Linn, Lake Oswego, and Portland, OR.